The Camino crosses two beautiful mountain passes and continues on through beech and oak woods and meadows before coming to Espinal, where the panoramic views of the countryside with the Pyrenees in the background are a sight to behold. The river Arga runs alongside this part of the Camino and continues its course all the way to Larrasoana. Roncesvalles is one of the most emblematic places along the Way of St James; apart from marking the start of the Navarre section of the route, it is also steeped in history. This beautiful village is the setting for the Royal Collegiate Church, constructed in 1219 by order of Sancho the Strong, the victor of the battle of Las Navas de Tolosa. The king’s tomb is to be found in the Chapter House of this abbey. A few metres further along the route, walkers will come to a 14th Century pilgrim cross. An additional point to note is that it has become a tradition amongst pilgrims, believers and non-believers alike, to attend the pilgrims’ mass on the eve before the start of their adventures along the Way of St James. Once on the route, the first town to appear is Burguete, renowned for its sturdy Pyrenean style farmhouses, then Espinal, a typical Pyrenean village founded by the Navarre king Teobaldo II in 1269. Along the route, and before reaching the next town, pilgrims will pass through the Alto de Menkiritz mountain pass where a stone tablet reads “Here you can pray a Salve Regina to Our Lady of Roncesvalles”. The path then goes on to Viscarret which formerly had a pilgrim hospice. 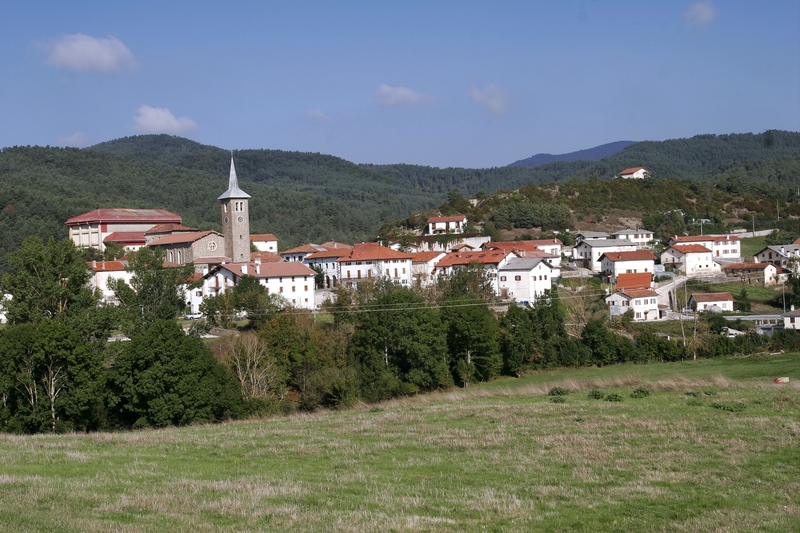 Some kilometres further on, the route branches off for a short distance and passes through beautiful town of Erro. However, after leaving Viscarret, if you continue along the road without taking the fork, you will come to Lintzoain – the setting for a beautiful Romanesque church dedicated to St Saturnino – and then up the Erro mountain pass, famous for its incomparable scenery and impressive panoramic views from its highest point. Going up the Erro mountain pass, pilgrims will discover “Los Pasos de Roldán” or steps of Roldán – a great stone which, according to legend, marks the size of Rodán’s footstep. This first stage along the Way of St James ends at Zubiri, a town reached by crossing the gothic bridge of La Rabia which, according to tradition, can cure an animal suffering from rabies, if the animal goes round the centre pillar of its arcade three times.